I had a dream. I say, had, because this is one of those dreams that came true therefore it can now be referred to in the in past tense. Isn’t it nice when some dreams are so simple as to be able to check them off your list, move them from have to had? So, back to my dream. What was it, you ask? Well, let me tell you. My dream was to Trick or Treat at Halloween…wait for it… in nice weather. To Trick or Treat just like they did in the movie E.T., where it was warm and sunny and people could just wear their costumes. And by “just wear their costumes,” I mean, whatever costume they want to wear and just that. Those of you who do not live in the dead of winter may not understand what a treat it is to wear your costume and only your costume and be that which you really want to be on Halloween. In the North you have two choices for Halloween. To wear a costume to school or to an indoor party that, when worn outside, will not be seen due to the necessity of a snow suit and toque overtop. Or, to have a costume that will fit over a snowsuit, either being five times too big or being warm and fuzzy like, say, a bear. Ever since watching E.T. as a child and discovering that there are places in the world where it is not snowing on October 31st, I dreamt of a Halloween in beautiful, warm weather among other Halloweeners that were happy to be outside, not battling frost bite and counting down the minutes/houses until they could go home and warm up. And luckily, this dream was able to come true this year (Thanks to NitroCircus coming to Anaheim so I could plan this entire trip under the guise of gifting my husband with NitroCircus tickets for Father’s Day) because this year, I spent Halloween in sunny California. Of course, just California wasn’t good enough for us. 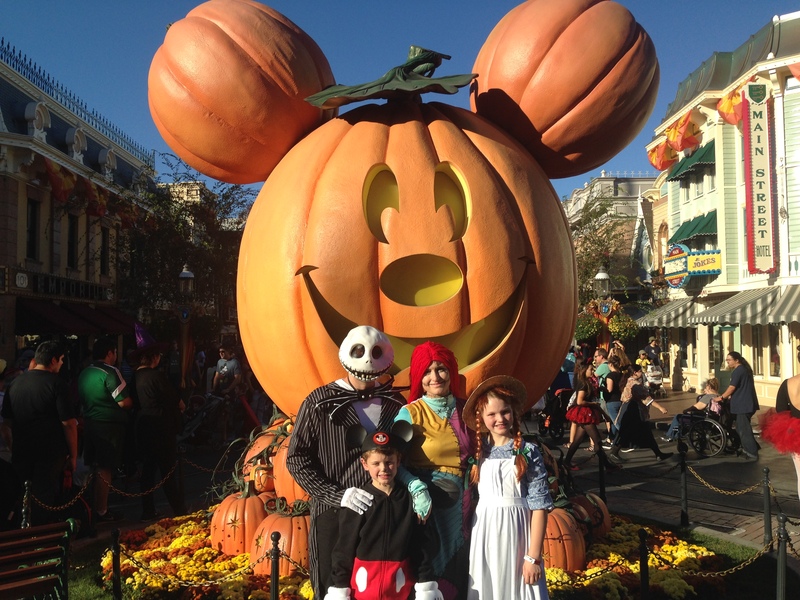 Being the Disney-freak/s that I/we are, my family and I spent Halloween at Mickey’s Halloween party in Disneyland. And I will say, it was the best Halloween I have ever had. I could probably argue that not freezing to death and actually complaining (well, not complaining. We would never complain about heat when temperatures are below freezing at home) about heat was enough to make this Halloween the best ever. And honestly, the beautiful weather was definitely a contributing factor to its awesomeness. To be able to walk outside in my costume and actually be warm, without wearing a fuzzy bear suit, was a feat in itself. The first of its kind in all the 36 years of my life. I could have easily just walked to any random neighborhood near our hotel and Trick or Treated and been absolutely ecstatic. But I didn’t. 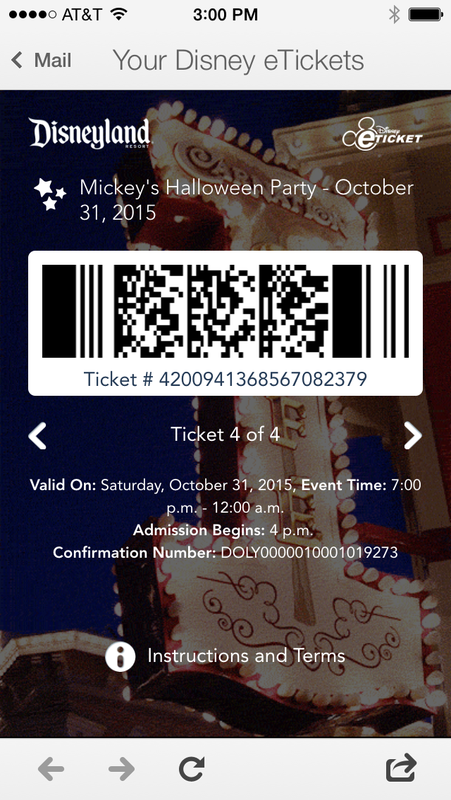 Instead, I took the experience that much further and joined the throngs of ticket holders fighting to get into the park for the annual Halloween party. And I am so glad I did. 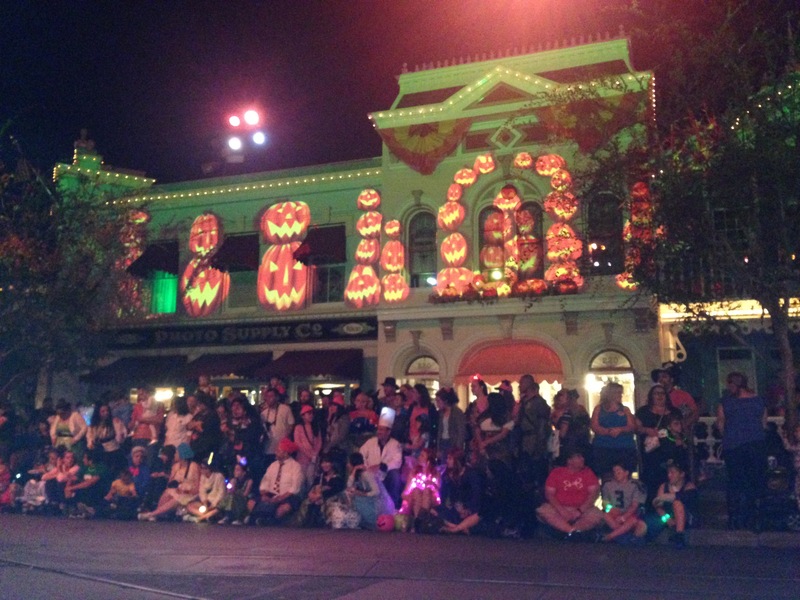 Now, the first questions I am asked when I mention Disneyland is, “How were the crowds? Wasn’t it busy?” And yes, when we walked up to the gates and there were huge lines I thought, Oh no. What did we do? But the lines moved quickly and everyone was quite conscientious, for the most part, and actually, standing in line ended up being quite fun. We spent the first fifteen minutes before they opened the gates simply taking in all the costumes. And there were so many. I would guess that about 75% of the Halloween Party attendees were dressed up. And for the most part, they were your typical Halloween costumes, albeit with a tendency towards Disney characters as opposed to others. Take us, for example. I was one of at least half a dozen Sallys (from Nightmare Before Christmas) in our chunk of line alone, and my husband was one of many Jack Skellingtons. But it didn’t matter. It wasn’t a competition. If anything, there was a smile and a nod and an appreciation of the costume. 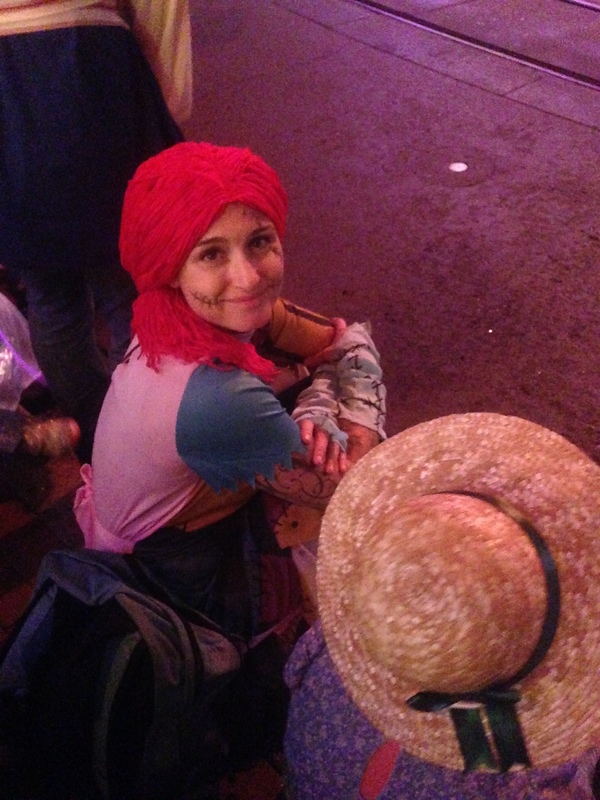 (And I have to say, wearing a long red-haired wig was AWESOME, even if it was made out of yarn. For the first time in my life I got to have long, long hair. Oh, it was heaven. It was awesome enough to consider wearing a wig everyday. But I guess, I’ll just have to wait for next Halloween to feel that beautiful again, stitches across my neck and face and all). 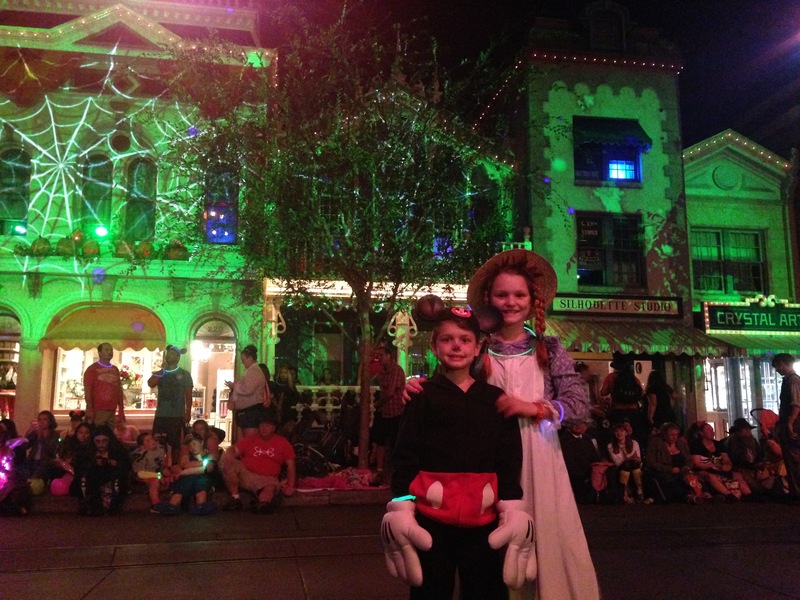 My son actually made up his costume from the Disney gift shop as his had blown apart the day before we left for Anaheim. 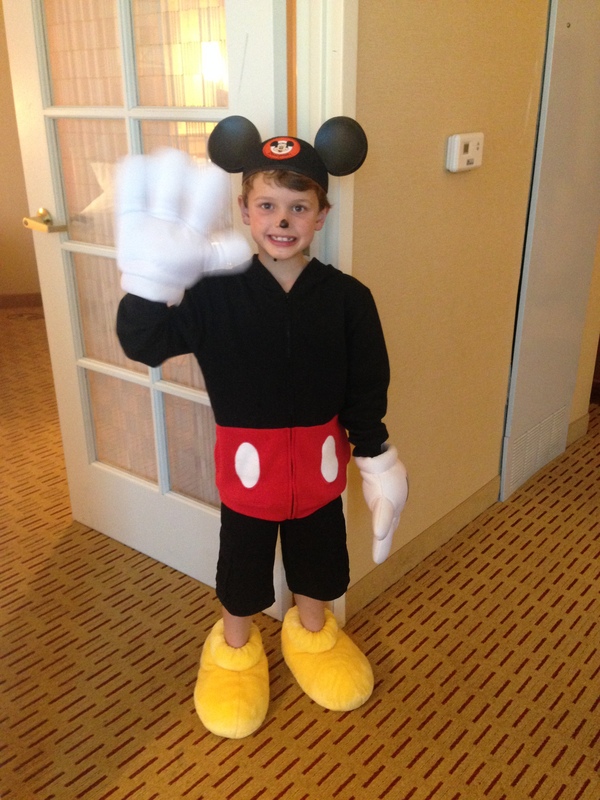 He found some Mickey ears, a Mickey hoodie, big yellow Mickey feet and the big white Mickey gloves and he was the cutest kid I ever did see. And yes, he spent the entire day in slippers, and he was in heaven. I will say, however, my daughter’s costume beat all of ours. She was Anne of Green Gables. And only about three people in the park recognized her. But the ones who did were so excited to find a kindred spirit and went on and on about how much they loved the story and books as a child. We were not, by any means, the highlight of the dressed up families. There were so many themed groups that it was fun just to find them. Stars Wars families seemed the most popular, with big and little Darth Vaders, Han Solos, Princess Leias, and so on. There were Guardians of the Galaxy, quartets from the Wizard of Oz, Alice in Wonderland characters, Minions, Harry Potters, basically, think of any character from any family friendly movie in the past fifty years and they were probably there. On a side note, a big shout of thanks goes out to those people who dressed up as Waldo from the Where’s Waldo books. They brought hours of enjoyment to me and my family. I would spot the striped toque or shirt in the crowd and shout out, “Where’s Waldo?” and the search would begin. Who knew I could have so much fun finding real life Waldo, but I did. So thanks to you guys. And speaking of crowds and line ups and costumes, well, on Halloween the line ups seem so much shorter because you are so entertained watching all the costumed people go by, and of course, searching for Waldo, that it’s hard to care that you are waiting half an hour for a picture by a pumpkin. So, a few technical points about the party. Yes, you have to stand in line to trick or treat, but the line moves fast and there are about 4-6 trick or treat stations per line and they give out handfuls of candy instead of a bar or two. So it’s totally worth it and we got more than our fill and didn’t even hit up every station. Because everyone is enjoying the rest of the party, the lines for the rides are slim to none as everyone else is getting candy and seeing the characters, so we got to hit up rides over and over again with no wait. Except the Haunted Mansion and the Scary Space Mountain. Those were quite long. So we avoided those until later. And we didn’t wait in line to see the characters, although we wish we had, they were just too long and we didn’t have time. But it was cool to see the Disney Characters you don’t usually see from a distance, like, Jack Skellington and Sally, the Wicked Witch, Jafar, and the rest of the Villains. It I hadn’t contracted the flu, we probably would have stayed until the end and gotten all our pictures taken with them. But oh well, we’ll have to do that next year. Basically, it was normal life made absolutely extraordinary and I loved every second of it. Even when I seemed to be coming down with the plague, I could just sit and take it all in, smiling at all the ridiculous sights. Did I mention, until this year, I have hated Halloween? I felt silly dressing up. I didn’t like going to strangers houses and asking for candy. As I got older, I hated the parties and the drinking and fact that girls paraded around in underwear and called it a costume. Halloween had become a day to get over, having to force my daughter to trick or treat with her brother because she also hated it, and standing in the freezing cold waiting to go home. But in Disneyland, I love it, we all loved it. And I hope to go back again and again and again. It brought the magic back to the holiday for me. I was able to enjoy myself and get a taste for why Halloween is so popular. So thank you to Disney for putting on the party and to everyone who went and dressed up and smiled and laughed and joined in the fun. And if you haven’t gone or if you are like me and dread Halloween in the freezing cold, hop on a plane and head south for the holiday. Because down there, that is really what it is…a holiday.